I’ve tried – and liked – many different granola recipes over the years, but this is my go-to recipe every single Christmas. Packaged with a Christmas bow and cutesy label, it makes a perfect homemade gift for teachers, neighbors and friends. In fact, certain of my family members and friends have come to expect (demand??) this granola from me every December! This recipe, only slightly tweaked by me, comes from one of my very best friends. When I got married, she gave me a handwritten cookbook that included this (best wedding gift ever, by the way!). It’s crunchy and chunky and sweet and everything you could possibly want in a bowl of granola. I’ve even known people who “don’t like granola” to get hooked on this! If you want a really big batch, this recipe doubles easily and can be stored in the freezer for months. Even though it works great as a gift, you definitely want to save some for yourself. Eat a bowlful of it as a breakfast treat, grab a handful of it for an afternoon pick-me-up, or sprinkle it on ice cream or yogurt… yum! Mix dry ingredients together in a large bowl. Heat wet ingredients in a saucepan over low heat until warm, stirring occasionally. Pour over dry ingredients and mix well. Pour into a 10″x15″ baking dish and bake at 250 degrees for 2 hours, stirring every 20-30 minutes. After 2 hours, press granola down firmly into pan, turn your oven off, and put the pan back into the oven. Leave it in the oven until completely cool (several more hours). This last step helps create more crunchy chunks, which I love. If you happen to like chewier granola, cook it for a shorter amount of time, and let it cool on the counter instead of the oven. « CVS: Get Pampers diapers for $3.99 per package — though the end of today! This sounds delicious … can’t wait to try it! That looks Amazing….I must try this recipe….. This recipe IS amazing..made some today. How many cups does this recipe make total? How many cups do you include per person when you give it as a gift? I’ve actually always wanted to measure how many cups it makes, but have yet to do it… it starts vanishing about 2 seconds after I take it from the oven. 🙂 I’m guessing somewhere in the 14-15 cup range, if you leave it chunky like I do (which means there’s a small amount of “air space” in each cup). For a teacher/single person, I usually do 2-3 cups; for a family I would do more than that – maybe 4-5 cups? The average box of granola you buy at the store is going to have 5-6 cups, if that gives you an idea. You can also wrap it in smaller portions – around 1 cup each – pair it with a couple of other different kinds of homemade treats, and arrange them on a tray or tin as a gift. Thank you for your help!! The amounts and gift ideas are very helpful! I will be making treats as Christmas gifts for the 1st time this year. I think your recipe will be enjoyed by all of my family members. 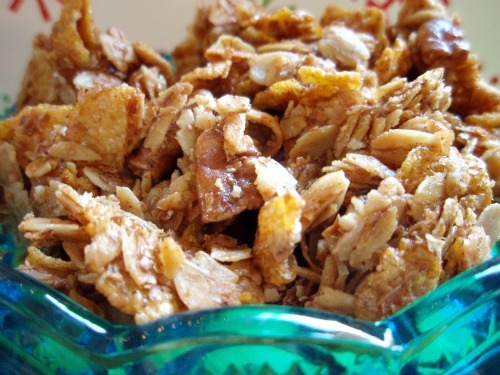 This is really similar to our granola recipe, minus the cornflakes. I bet they add a fun crunch! Thanks for the reminder to make some this evening! This sounds so good, and looks dlicious! I can’t wait to make it. I just need to go and buy some corn flakes. Hmmm, do you think ground flaxseed would work in place of the wheat germ? I am a big fan of using what’s on hand and we ran out of wheat germ recently. I have a this recipe but I substitute 4 egg whites beaten fairly stiff for part of the oil. I use 1/4 cup oil, mixed with the honey. After all the grains and wet ingredients are mixed I fold in the beaten egg whites. We also add dried fruit. Cranberries or apricots whatever is on hand. Makes a great granola. Do you think any other type of flake cereal would work as a replacement for the corn flakes? In particular something like Special K or All-Bran Complete Wheat Flakes (the wheat version of corn flakes)? You could definitely substitute other flake cereals that you like. Also, I don’t have a 10″ x 15″ baking dish. Could I divide this into two 9″ x 13″ or would the granola layer be too thin? Do you have a cookie sheet with sides to it? That’s actually what I use. Otherwise, I would just go with one 9×13. I say go for it. 🙂 The finished “texture” will be a little different, but it should still be good! Do you buy a coconut and cut it up, or do you mean shredded coconut? Please elaborabate. Sounds yummy. I have to say that this is fabulous stuff. I omitted the wheat germ (I live in a very rural area and can’t find anything close) and the pecans (just because I like to add stuff, not have it in it). This recipe is FABULOUS. I make my own “fake syrup” so it was another nice added touch. Here is a link to the syrup recipe. , if anyone is interested. Glad you liked it! I agree – it IS good stuff. 🙂 And thanks for the link, too!! I make granola in the crockpot all the time. I turn it on high and stir it every time I smell it cooking. It takes a couple of hours, but I’ve never burned it (unlike every time I’ve made granola in the oven). Brigette, thanks so much for this recipe! 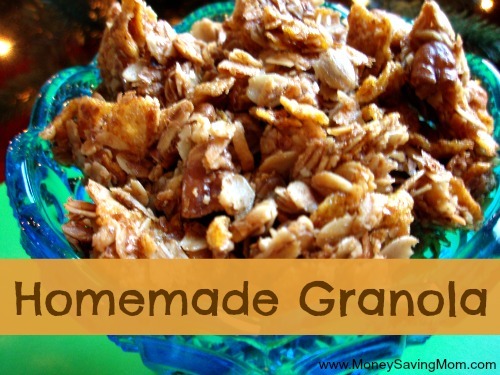 It’s different from my usual granola recipes, and very yummy. I think it tastes like homemade Honey Bunches of Oats 🙂 I just have one question- I made this on a cookie sheet covered with foil, and had greased the foil. The granola still stuck horribly. Do you just put it directly on the cookie sheet, and scrape it off? Thanks again! I just put it directly on my ungreased cookie sheet (I do have pretty high quality, new-ish sheets so that might make a difference). I’ve never had a problem with it sticking, so I’m sorry you did. It definitely could be the foil, though.